I Know this is long range but I have been watching the indices the past few days and since the pattern is changing I wanted to keep on this time period. I am seeing that the Euro EPS and NCEP GEFS Teleconnections are flipping in this time frame to a +PNA, -AO and -NAO. There's also the MJO which is now forecasted to back track into Phases 2 and then 1, albeit into the null phase, it is still backtracking. 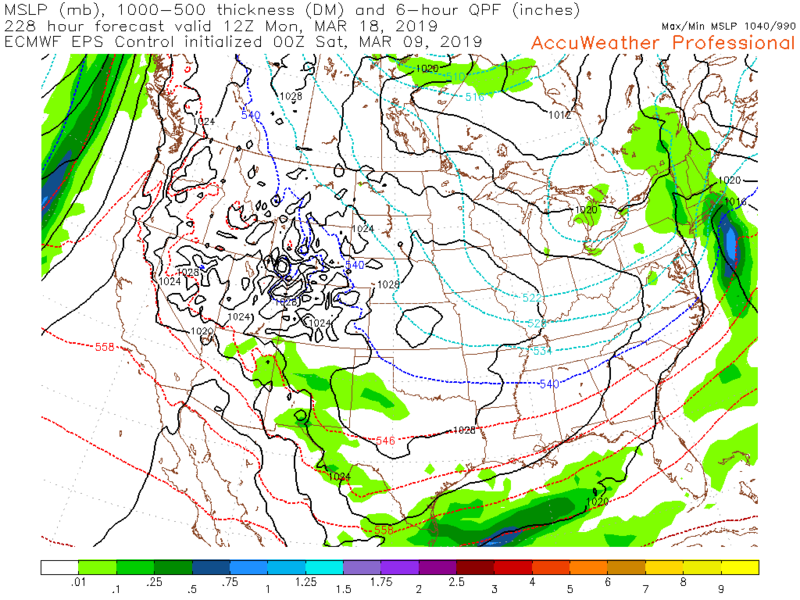 The 12Z GFS today on 2019-3-5 Shows the potential. This is 10 days out and this thread may die or date change but wanted to put it out there. Euro EPS Tele Graphs originally posted above were from 0Z overnight. Here are the 12 Z shots. Correct. Need to cash in on the energy and get that to dive south more. I’m liking the setup this far out though. What? +PNA isn’t great, but I would think you’d want one for acridge in the west, granted, bigger ridge could be bigger trough out east. Affect vs effect. I forget. Noun vs verb. You get the point. As we head towards spring, the teleconnections become less defining as wavelengths lengthen. We know that is completely off-topic, don´t we? What a storm on March 22nd has to do with a thread for a possible storm on Mach 15-17? Please discuss the time frame for which the thread was started, otherwise, I will need to remove the off-topic posts because they will most likely make posters continue to comment on them. Off-topic posts have been moved to the storm specific thread. Cmc says Minnesota gonna get a nice storm.... Very deep!! Impressive!!!!! Well, So much for this potential. Still a week away, but not looking good. Welp. I am hoping for some good thunderstorms from this system since it looks like that it will warm up here. Another storm that should usher in spring-like temperatures for MBY with 60ºF or warmer expected Wednesday, Thursday, and maybe Friday too. It should some great hiking weather this week. I've already noticed some flowers popping up and this warm stretch should encourage more. The 7 inches we had here two days ago is all but gone. Temp 53F. Crocuses, Tulips, and Daffodils are pushing up in my flower beds. Today was supposed to be categorically sunny--the brightest one of the week, but it is dreary out, with only filtered sunshine. The clouds from this upcoming system must have reached us a day early--or the clouds from the previous system decided to stick around one extra day. What it is, is typical Greater Binghamton weather. When I expect a bright, sunny day, something usually goes wrong. Since there is no thread for March 13, I will throw this into this thread: We've received about an inch of snow tonight and it continues to snow moderately. It started heavy after 7 and started immediately sticking to the roads. I was out and had no clue we were supposed to receive much snow. It is expected to taper off by 10 pm. Winter keeps trying to hold on in northern New England.